Australia’s hardwood plantation estate is predominantly comprised of Eucalyptus nitens and Eucalyptus globulus, which are mainly being managed to produce woodchips—a low-value commodity export. 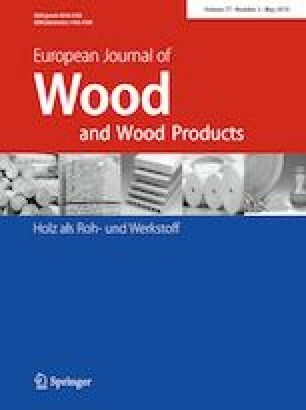 There is an increasing interest by the timber industry in developing higher-value structural products from the low-grade timber recovered from these plantation resources. In this experimental study, for the first time, the bending performance of nail-laminated timber (NLT) and NLT-concrete composite (NLTC) floor panels constructed of the low-grade, fibre-managed Eucalyptus nitens and Eucalyptus globulus timber was evaluated. The test panels were constructed with various span lengths and cross-sectional configurations and subjected to vibration and four-point bending tests. The results indicated that the modulus of elasticity of the Eucalyptus nitens NLT panels (11,074.6 MPa) was comparable to that of NLT panels made of Eucalyptus globulus (11,203.2 MPa). The modulus of rupture of the Eucalyptus globulus panels was 13.8% higher than that of the Eucalyptus nitens ones. The bending properties of the NLT panels constructed of the two plantation species were superior to those of some commercially important mass laminated timber products reported in the literature. Under the limit state design loads, all the NLT and NLTC panels were still in the linear-elastic range. The fundamental natural vibration frequency values of the test panels were above the recommended minimum range of 8–10 Hz for residential and office floors. The two plantation timber species therefore demonstrated sufficient short-term bending performances to be used in the construction of higher-value structural floor products. This study was undertaken under the Australian Research Council, Centre for Forest Value, University of Tasmania, TAS, Australia (Grant Reference: IC150100004). The support from Forest and Wood Products Australia Limited (FWPA), Melbourne, VIC, Australia is acknowledged (Grant Number: PNB387-1516). The authors are also grateful of the support from Forico Pty Ltd. in providing the logs and Britton Timbers for the milling of the logs and drying and finishing of the boards.